The following is a text received from Myrna Kostash in Edmonton, Alberta with a request that I post it on my blog. Originally written for the Central European Journal of Canadian Studies, gladly and sadly do I post it here for more people to read. In my desk in Edmonton, I have a blue paper file labelled simply “Burke.” I have many correspondents, but Nancy Burke is the only one whose letters warranted their own folder, for they were always several pages long, often with last-minute marginalia scribbled in the margins in all directions of the page, stuffed with newspaper clippings, and always written with the engagement and passion and intellectual and emotional honesty that characterized every exchange I ever had with her, written and face-to-face. We met in WarsawI think it was 1986when she was already an exchange-professor with the Department of English Studies and I was on one of my several research trips to Poland in the 1980s. We met in the editorial offices of the magazine, iteratura na swiecie, to which we had been invited for the same purpose: to act as consultants with the editors as to the contents of an issue they were planning, dedicated to contemporary Canadian literature. The fact that our advice was thoroughly ignored (the editors went ahead and included Malcolm Lowry, but no woman writer other than Margaret Atwood) consolidated, I think, our friendship, and set the tone for it: we were kindred spirits, politically and intellectually, who very much enjoyed the forum we provided each other to vent our thoughts and feelings on any subject. The fact that Nancy had been born an American but, with her and her then-husband’s move to Canada in 1966, had transferred all her considerable civic patriotism to her adopted country, further cemented our bond. We met only occasionally, and once Nancy had definitively decided to live and work in Poland and cut her ties with Canada (she sold her house in Toronto and resigned from Sheridan College), even less frequently. But our letters filled the space between us. From a letter February 1989: The Round Table is the subject of all conversations these days as well as being the news in the papers daily and on T.V. It is really amazing to see all these people on T.V. who a few years ago were personae non-grata. Walesa is the man of the hour and seems more and more statesmanlike and impressive. It’s anyone’s guess as to what will result from all this. The very fact that they are talking, on the government’s initiative as well, is good, and of course Solidarity is to be legalized and is bound to become a major force. Everyone is talking “pluralism” and “democracy” and “a new type of socialism” these days. However, the strikes that are starting are worrying. Inflation is sky high…I have done more travelling around the country, just returned from four wonderful days with R’s family in Sandomierz, speaking only Polish, I might add!…The new First Secretary for cultural affairs at the [Canadian] Embassy…has talked with me about giving lectures in Canadian literature, which I am only too happy to do and so I’ll be going to a university in Opole to give the first one in a few weeks….Must go now, off to the dentist. That will be fun. They don’t have any novocain these days. Her teaching was her passionI believe it was the reason she finally chose Poland over Canadavand no letter failed to include some observations on how her students were doing, and how very proud she was of their work. It is a measure of her natural modesty that she was always “bowled over” when her students expressed their gratitude for her labours on their behalf. Similarly, she was overwhelmed by the appreciative audiences she garnered for her published poetry, some of it translated into Polish, Russian and Serbian. 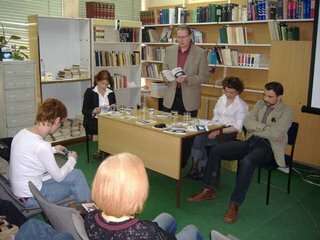 One of her happiest moments was her visit in 2005 to the Belgrade Book Fair and the University of Nis in Serbia, a visit arranged by her translator and cherished colleague in Canadian Studies, Dr. Vesna Lopicic. One felt that each Musethe teacher and the poetsustained each other. After 1989, and the normalization of postal communication with Poland, and especially once Nancy and I both had mastered the technique of e-mail, her messages to me came fast and furiously, with much forwarding of articles from various political websites. Much of this remained within the realm of spirited reportageNancy’s often salty comments on post-Communist Poland could distress me as much as entertain me, for we shared a rather romantic view of “upsurgent Poland” that should somehow not have chosen the free-booting capitalist alternative. But she was the one living there, not I.
P.S. I do indeed wish we could set up a real dept. In Can Lit hereif there were only more money. I have been talking to M.G. about a Canadian Studies program since he teaches History and Culture, or even a Dept of Other English-Speaking Countries, i.e. Canada, Australia, the Caribbeanlots of possibilities. From a letter May 1994: I contine to be very happy in my work, all of it, here. Classes are always great. The Canadian Studies Centre, with a lot of hard work on my part I can tell you, is moving along…Basically I am feeling more centred myselfin my free time I am in the forests a lot, and find the contact with nature very soothingI love the Polish forest especially in Spring…Warsaw has changed so much. While life is superficially easier, i.e. much more is available in food stores and they stay open all hours, I miss some of the things of times past and I cringe at the sight of Pizza Hut across from the Royal Castle, the Burger King around the corner from the university.I never realized how ugly naked capitalism could be; so was naked communism, but isn’t there another solution? From a letter December 1994: Here in Warsaw I have just finished reading, actually for the first time, Timothy Findlay’s The Wars for my Can Lit class…and I’m sorry, I think it’s a mediocre book. In fact, other than a couple of short stories I’ve never been terribly impressed by anything he’s written. It always irritates me a writer hasn’t bothered to “do his homework.” Right at the start he gets his history wrong, he talks of the start of World War One “when the Germans invaded Poland” !! for God’s sake Poland didn’t even exist as a country then and part of it was German. When I teach it, I’m simply going to ask those students, all very bright, for their critiques and see what they come up withbut this won a Governor General’s Award??????!! The Can Studies Centre opened officially, the Ambassador came, the Rector came, Seagrams Canada donated French champagne and it was a great success, considering that it’s not very large and financially under-supported. I did everything myself since I have no secretary or cleaner, I bought carpets, curtains, etc…I was completely exhausted. Now we just need more books and materials. It was a source of pain to her that Polish public opinion was so pro-American, while her own political views were fuelled by her unappeasable disgust with George W. Bush’s administration. But gradually, as Nancy’s ties with her son, daughter-in-law and, eventually, grandchild in Moscow, strengthened, and as her work with Canadianists in Russia took her on several joyful trips there, and she felt the injustice of the popular Polish hostility to Russia, our exchanges became rather more barbed on the issue of the nature of post-Soviet Russia, for, as a Ukrainian-Canadian, I had very much my own point of view on the nature of the Russian state! This tension between us came to a head during the events of the so-called “Orange Revolution” in Ukraine at the end of 2004, when we would forward to each other articles clearly denouncing the other’s opinions. For the first and only time in our friendship, we were not in basic sympathy with each other’s point of view. We retreated from the confrontation with a tacit agreement that she would not forward articles about Ukraine and I would refrain from doing the same about Russia. But there was another element to the evolving complexity of our friendship, and that was my return to the Orthodox Church of my upbringing, and Nancy’s powerful affinity with the Orthodoxy she experienced in churches in Moscow and Warsaw. On my last visit to Warsaw in 2004, and the last time I was to see her, Nancy took great pleasure in our visit together to the beautiful little Russian Orthodox church in the Praga district of Warsaw. She had begun studying the Russian language (adding to ther linguistic repertoire of French, Spanish and Polish), and it was obvious that the simple welcome she was extended in this church, the beauty of its icons and it liturgy, were a great consolation for her. In Serbia, she had written me, “I felt a real kinship with the Slavic soul there. One afternoon I toured the Orthodox churches in Nis – met the clergy, heard a choir sing, bought icons and lit candles.” For there was in her core being, I felt, a loneliness that no amount of friendship or collegiality could assuage. For all the frank and loving communication over twenty years, I always sensed that someinexpressible perhapsmelancholy was her constant existential companion. She then wrote of an “odd experience” she had had in Nis when, on leaving the theatre one evening, “a woman, nicely dressed, seemingly quite sane, said to me in English, ‘You have a soul. I have to tell you that. It is wonderful that you are here; it is wonderful to be in your presence.’ I was so stunned by this encounter that I never thought to ask her what she meant, or why me? Strange, isn’t it?” It is more than strange: it is a haunting late moment in what was to be the closing of her life. Three and a half months later Nancy Burke was dead. Can't write a lot as I tire easilyprobably the medication, but the election results in Canada weren’t too bad. Could have been worse since I read that with a minority, [Stephen] Harper won't be able to do anything radical. I note that Michael [Ignatieff] won in the Lakeshore ridingshocking! Did the Ukrainian Canadians there actually vote for him? He will probably be the eventual Lib leaderworld class star? Give me a break. That was one of the most cynical moves in politics. Oh, as to the baptism question. Well I was baptized as a baby as Anglican. Would love to incorporate myself totally as adult into the Orthodox Church, which is definitely the religion in which I've found a home. But...I feel strongly about cremation and the Polish Orthodox Church forbids it so this is rather a hurdle for me. In the end, she was cremated and taken back to Connecticut, to her parents’ grave. Her colleague, Dr. Ana Olos, of the University of Baia Mare in Romania, sent me this note on the news of Nancy’s death: “When I got up this morning, one of Nancy’s booksWypalona Ziemia / Scorched Earthopened at a poem entitled “Black Dog”. I copy the end of it: "When screaming you awake, / the room is empty / outsidethe sound / of one barking dog / breaks the stillness / of the country night. / And there is no rest." But perhapsas she now knows?there is rest. As the Orthodox pray for the departed: "With the Saints give rest, O Christ, to the soul of thy servant, Nancy, where there is neither sickness, nor sorrow, nor sighing, but life everlasting." Vichnaia ii pamiat'. Eternal be her memory. I'm in a whirl of activities now after a small funny of confusion upon arrival in Budapest. I wasn't met at the airport. Rather, the Airport Minibus had received a fax directing them to sell me a ticket and to deliver me to an address in the city centre (but they didn't give me the fax to read). That sort of worked: after dropping several people off at hotels, including the InterContinental beside the very swollen Danube River, I was dropped off at a short street leading into a square. Unfortunately, I had no info on where exactly I was to go or who might be meeting me me there. I hoped Jelena but didn't know . . . Stood against the wall of a building after wandering around the not-square plaza square looking at not open restaraunts, a casino, statue-monument, new building construction site, postcard kiosk and the people. Regular people, one woman with hot pink hair, a delegation of Japanese men in a military-security escoted convoy of black cars . . . Was a cold day, threatening to rain. I added a second shirt. Eventually, after an hour and a half of waiting and wondering what next? the pink-haired woman I'd seen earlier came up and asked if I was Dzo. Found! I walked with Monika to an apartment in a building across the square where I was shown a room and left to rest. Jelena calls and arrives and, later, Vincent showed up. The next day was mid-20s C and sunny. Spent the day up in the old Buda castle, wandering around. Bought, wrote, and mailed three postcards (will send more from Beograd). 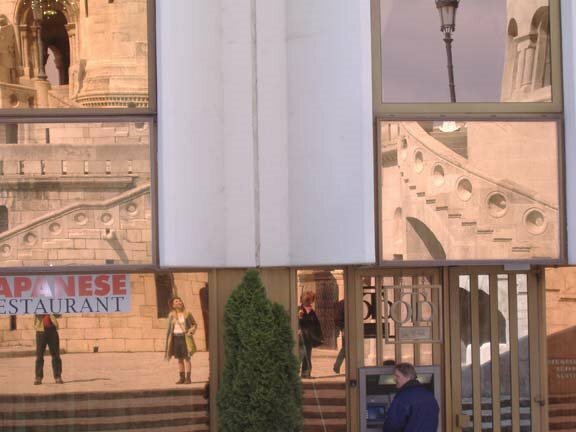 Photo above is part of the walls of Buda Castle reflected in windows of a Hilton build inside the walls. "Ön itt áll" is Hungarian for "You are standing here." The Sava in Beodgrad is flooded similiar to the Danube in Budapest, but not as treatening, worrisome, as the river in Prague. 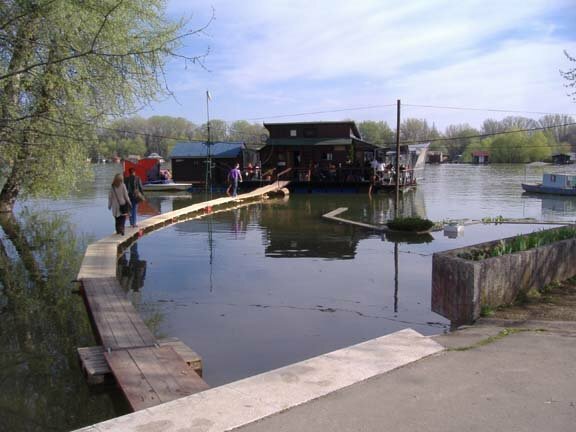 Some floating restaurant & kafe bar owners/managers have been able to build temporary boardwalks from the current shoreline (water overtop of a riverside walking path and road) out to their establishmentssuch as the Skalar (above). Was a very busy Sunday for the ones open. They are great places to spend a few hours in relaxing conversation. Dubravka, the translator of Pesme is kazamata messed up and wasn't able to participate in the first reading of this promotional reading tour so we asked Marko Kristic, the author of the 11 March review-article in Danas to travel with Jelena and me to Krusevac for the reading last evening. The bus to there was unbearable hot. Krusevac is a city of 65,000. I am/was the first overseas author ever to do a book promotion there. Had two television inverviews, a newspaper interview, and two radio stations covering the eventcrazy good media coverage. Marko was excellent to introduce me and the book. The woman at the end of the table is our host, Sonja Velejkovic, Director of Narodna biblioteka Krusevac. We sold more books than we had with ushad to mail prepaid ones today. Tomorrow is the tour's big launch event with more media at Kulturni centar Beograda. All day lugging boxes, trying to empty my stuff from the storage cage in the basement of the building on Argyle St. Still stuff there. I ran out of time. The apartment 's hall and rooms are mountained with cartons. Almost nowhere to turn, to move, and it must stay this way. Tomorrow I fly away . . . Kept the show simple: Lisa Moore's short story "The Way the Light Is" read by the author. From Merrybegot by Mary Dalton (read by Anita Best) (Rattling Books) a mess of poems: After All That, Bachelor Brothers, Berry Pails, Bridesboys, Brin, Bull Arm Money, Burn 1, Burn 2, Burn 3, Clutch, Conkerbells, The Cross-Handed Bed, Cullage, Devil-Ma-Click, Devil's Fashion, The Doctor, Down the Bay, Elt, Fairy-Struck, Federal, First Boat, Flirrup, Gal, If Whiskers Was Wisdom, Jallneying, Jesus and His Gashes. Wayne Ray will be featured at the odd sundays at molly's poetry reading series. Third Sunday, 23 April 2006 [WORLD BOOK DAY], 2 pm, Molly's Coffee House, 554 Queen Street, Fredericton, New Brunswick. Wayne Ray grew up on the East Coast in the '50s and '60s and spent some time in the Fredericton area in the late '70s. 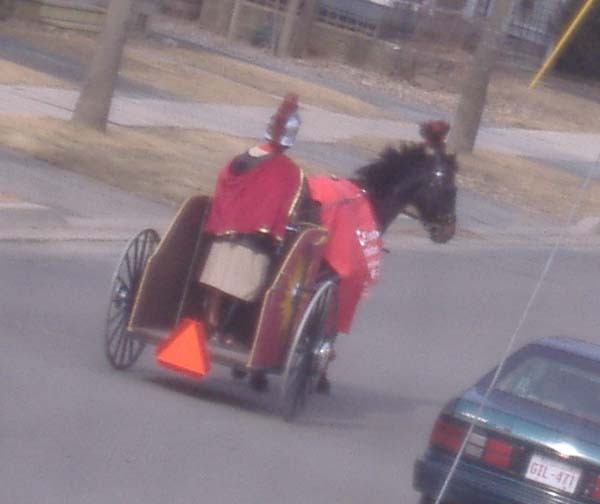 He returned to Fredericton to work at Canada Post in 2002 & 2003. He runs HMS Press and is one of the founders (1985) of the Canadian Poetry Association. This 100+ page book is the collection of all the poetry and short stories he wrote, as well as poetry written for him, while he was living on George Street, Fredericton. It is published by Harmonia Press of London, Ontario and can be ordered from the CPA Bookstore. "In the moving from one place to another, even if the transfer is only temporary, there is a fusion of the new and the old, the present and the past, and there is a distancing and a drawing closer. 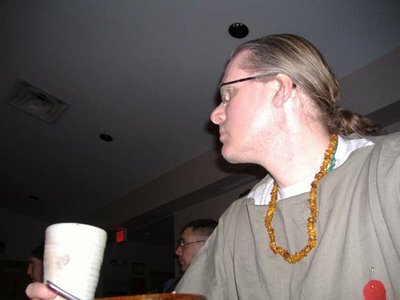 Wayne Ray, in his poetry and prose on a journey to Fredericton, New Brunswick in 2002 has created in his portrayed encounters on the road and in this new city a melancholy, yet hopeful feeling of distancing and connecting, and a sense of individuals searching and being in two places at once. The effects are subtle and lyrical giving the collection a variety of perspectives that are entertaining and thoughtful." "Wayne has a wonderful gift for the vignette . . . an unusual storytelling technique remarkable for its conciseness and exotic in its themes." "[Wayne's] writing brings so many elements into work and none obscure the meaning, this is fresh, moving, alive work." 2 pm, April 23rd, for odd sundays at molly's, Fredericton's longest-running, semi-monthly poetry reading series. Come for an afternoon engaged in the literary arts. 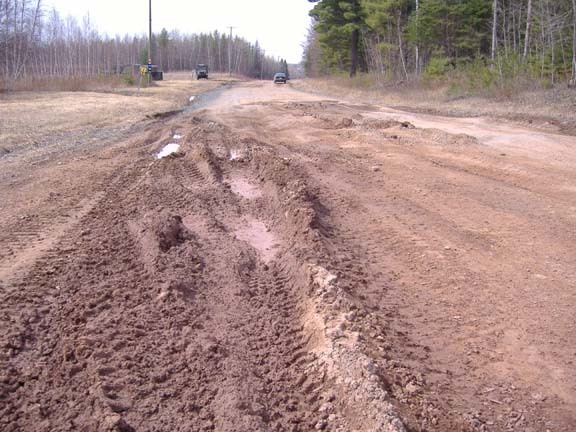 Info: acalvern@nbnet.nb.ca or 506-459-1436; Bruce Allen Lynch, 506-454 9222. 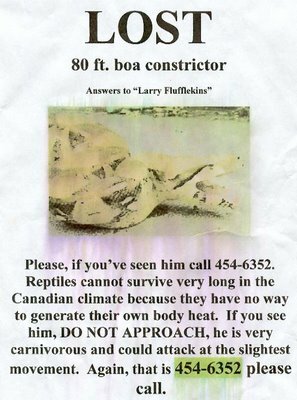 Several years ago I would select lost pet posters found during my artistic perambulations and send them to a mail art project periocical named pas de chance. 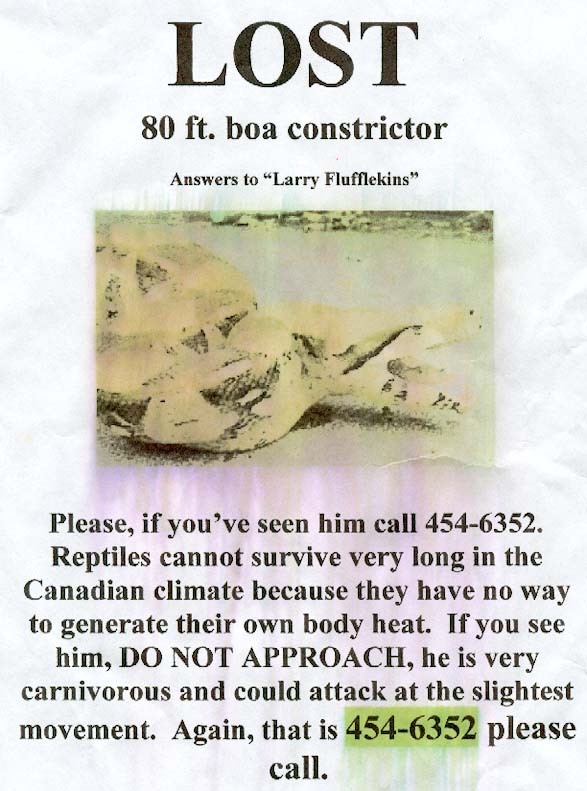 They reproduced, in a reduced size, lost pet posters submitted from around the world. The ever-changing issues came with a dog treat biscut and a pet tag glued to the cover of each copy. Today, just up York Street between Needham and Aberdeen streets, just south of my building, I found a king of lost pet posters, or at least a crown prince. . . Reminds me of the time I lost a 3-foot garter snake in the basement in our house in Dartmouth. That was a good-sized snake. It was either my sister Ruth or our mother who found "my" snake curled up inside the bottom of the still-warm clothes dryer . . . Happy New Year's Day all ye fools. I'm there with you. Was doing laundry Saturday morning while running around town: biked to StupidStore then walked to Victory for limited provisions and stuff. I'm not long for this town . . . three days and two hours. No NASA monitored countdown, just the earth spinnin' its wobbly orbit. In the kitchen making food or gathering feast gear for the afternoon, I heard the clip-clop of a horse. Looked out the window to see a Roman chariot on George Street. By the time I got my camera out, it was rolling down the next block. Nice start to April Fool's Day . . . a moving advertisement for an Easter pageant here in town. 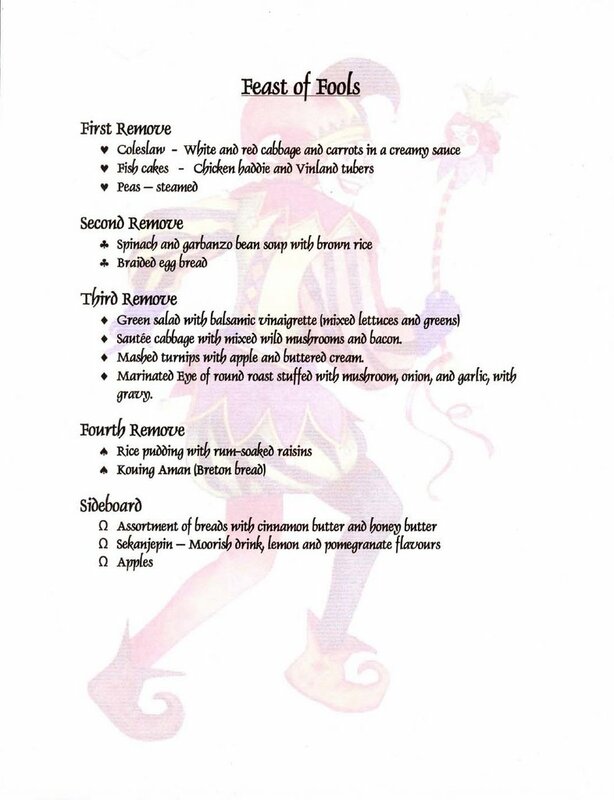 Heavily-guarded Feast of Fools this year. Vandoos had a working Checkpoint Charlie: radio communication, clipboards, generators and bright lights, coiled concertina wire in the ditches, sandbagged machine gun posts, troops with rifles, trucks and armoured vehicles everywhere. Those heavy vehicles, especially the loaded lowbed trucks had made a spongy, rutted Road of Fools back to the lodge. 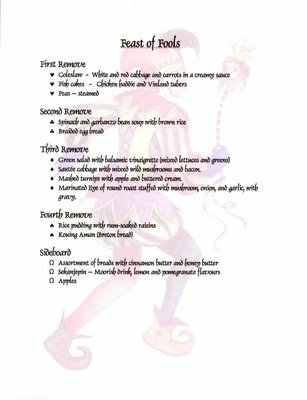 Lady Moriath of Kildare outdid herself superbly in preparing the feast. What great food! Food for more fools than were present. Everything from the soda, peasant, and braided egg bread through the soup, sautée cabbage and neeps, the marinated eye of round, the amazing rice pudding and Kouing Aman. What a not-to-be-missed spread. Vivat! Vivat! Vivat! Me and my drinking vessel (made by Lee Horus Clark) filled with sekanjepin. 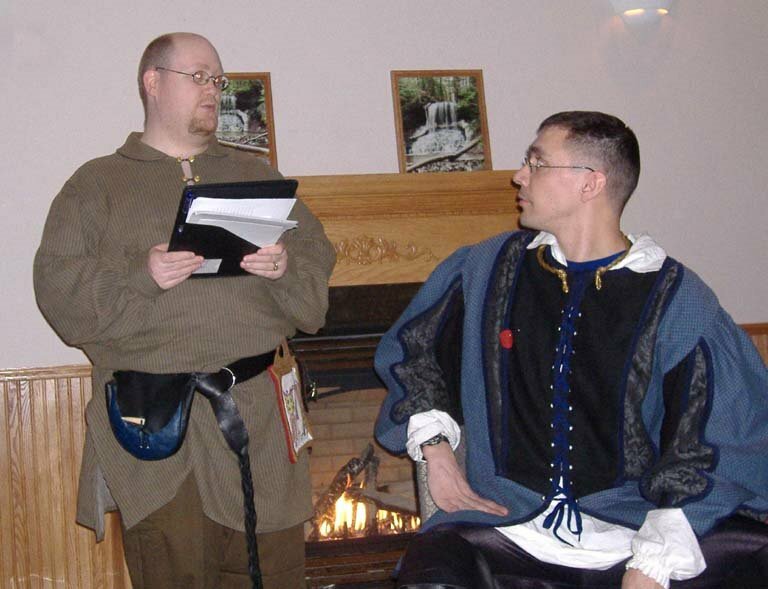 In the court of the King of Fools with Conogan as herald and Lord Mateo "the-Not-Challenged" declared King of Fools. Or King of Fools, making proclamations and charges, until he was defeated in a 2-of-3 rock & sissors challenge. Then Justine became Queen of Fools.